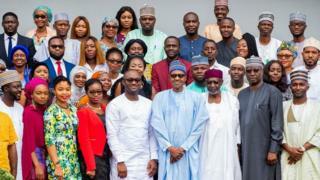 For May 2018, Nigeria President Muhammadu Buhari sign di 'Not Too Young To Run' bill into law wey suppose make am easy for young pipo to enter politics. Members of di Not-Too-Young-to-Run movement for Gombe State don hala say some state governors dey put sand sand for young pipo garri as dem try make tins too cost - tins like party nomination form. All Progressives Congress (APC), di kontri ruling party, wan make members wey wan run for presidency to go find N45 million - N5 million for expression of interest and N40 million for nomination. For main opposition People's Democratic Party (PDP), presidential aspirant go drop N12 million total even though some go say money for House of Assembly office no too cost at N600,000 total. "Dis pipo wey believe in your vision fit even gada money buy your expression of interest and nomination forms... and even run di campaign for you," tok Hamzat Lawal, wey also be founder of ifollowthemoney.org. "For 2015, many surprise when PDP lose...because no one believe say president wey dey rule go lose election," Lawal tok, but with di permanent voters card (PVC) and technology we get, people "vote go now count".